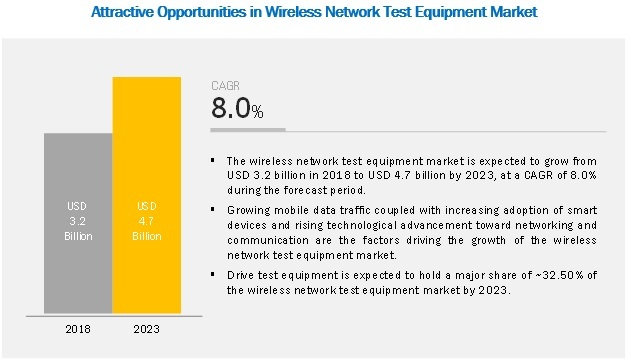 [132 Pages Report] The overall wireless network test equipment market is expected to grow from USD 3.2 billion in 2018 to USD 4.7 billion by 2023 at a CAGR of 8.0%. 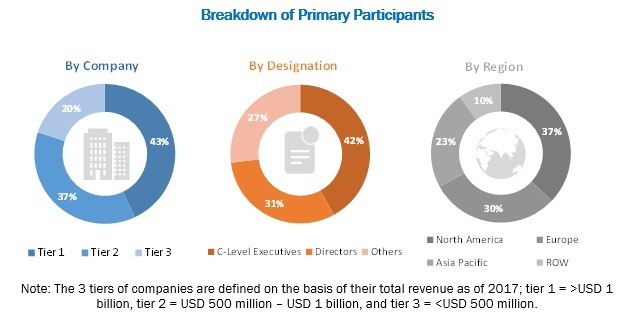 The growth of the market is propelled by the growing mobile data traffic coupled with increasing adoption of smart devices, rising technological advancement toward networking and communication, and increasing interoperability of network technologies. The wireless network test equipment market for OSS with geolocation equipment offering is expected to grow at the highest CAGR during the forecast period. Operations support systems (OSS) are the systems used by telecommunications service providers to manage their network by supporting various functions such as network inventory, service provisioning, network configuration, and fault management. Geolocation is a wireless mode to locate the physical location of a device. The mobile devices have inbuilt GPS receiver. The geolocation data of the mobile device can be used to conduct the network test. The 5G network market is expected to grow at a higher CAGR during the forecast period. The 5G infrastructure is in its nascent stage. The technology is expected to bring new unique network and service capabilities. It would ensure user experience continuity in challenging situations such as high mobility and thickly populated areas. The 5G infrastructure would help provide the connectivity of ¡Ý1 Gbps as speculated by leading network providers and 5G chipset developers. The 5G network is expected to offer a high data transfer rate, high device connection density, and minimum latency with real-time service delivery. This connectivity technology would provide network with extremely low latency, which would be the driving force for the new massive broadband applications. The enterprises is expected to grow at a higher CAGR from 2018 to 2023. Enterprises spend huge amounts of money on network resources to keep their network up and running all the time. This takes up a major portion of their time, leaving them with no time to form new strategies for the efficient use of network resource. Wireless network test equipment provides a cheaper way to manage and analyze the entire network, centralize, virtualize, and provide real-time applications and bandwidth management of the network to deliver critical business applications at a higher speed. The wireless network test equipment market in APAC is expected to grow at the highest CAGR during the forecast period. The growth in this region is also driven by the huge population, rising disposable incomes, and strong penetration of the advanced mobile devices in several Asian countries. Mobile data services are growing in APAC due to reduced prices offered by mobile operators to extend their services to maximum end users. Growing adoption of 3G and 4G/LTE and rising demand for high-speed data services have led to increased demand for wireless network test equipment in APAC. Furthermore, Japan, China, and South Korea are the frontrunners to deploy 5G in the near future. As of 2018, Anritsu (Japan), Infovista (Virginia), Keysight Technologies (US), Rohde & Schwarz (Germany), VIAVI (US), Accuver (US), Dingli Corporation (China), Empirix (US), EXFO (US), Spirent Communications (UK), Teoco (US), RADCOM (Israel), Gemalto (Netherlands), NETSCOUT (US), and Bird Technologies (US) were the major players in the wireless network test equipment market. Rohde & Schwarz provides test and measurement solutions to mobile network operators, infrastructure suppliers, and service companies to ensure the performance of the network, thereby showing efficiencies of a single supplier with an integrated global support network. The company is a leading supplier in the mobile and wireless communications sector, offering a wide portfolio of T&M instruments and systems for development, production, and testing of components and consumer devices, as well as for setting up and monitoring mobile networks. The company adopted strategies such as product development and collaboration. This will allow it to stay competitive in the market. In September 2018, Rohde & Schwarz launched the world's first commercial 5G NR network measurement solution. It consists of a network scanner with compatible 5G NR scanning software and R&S ROMES4 drive test software suite. In February 2018, Rohde & Schwarz introduced Smart platform to bring more efficiency in all aspects of mobile service and network testing. The Smart platform is a software suite that covers capabilities such as lab engineering, field acceptance, optimization, benchmarking, and monitoring with common modules. In August 2017, Rohde & Schwarz enhanced its Over-the-Air (OTA) test systems to meet new challenges of testing in 5G millimeter wave (mmW) environments. Which equipment of wireless network test equipment is expected to have the highest demand in the future? Which is the most adopted network technology type in the wireless network test equipment market? How is wireless network test equipment applied to facilitate the telecommunications service providers? What are the key trends in the wireless network test equipment market? Most suppliers adopt agreements, partnerships, and collaborations as key growth strategies (as seen from their recent developments); where will these take the market in the mid to long term? The study involved 4 major activities for estimating the current size of the wireless network test equipment market. An exhaustive secondary research was carried out to collect information on the market. The next step involved the validation of these findings, assumptions, and sizing with industry experts across the value chain through primary research. Both top-down and bottom-up approaches were employed to estimate the overall market size. Thereafter, market breakdown and data triangulation were used to estimate the market size of segments and subsegments. In the secondary research process, various secondary sources have been referred to for identifying and collecting information important for this study. Secondary sources such as encyclopedias, directories, and databases (Wireless Network Association, Small Cell Forum, OneSource, and Factiva) have been used to identify and collect information for an extensive technical and commercial study of the wireless network test equipment market. In the primary research process, various primary sources from both supply and demand sides have been interviewed to obtain qualitative and quantitative information important for this report. Primary sources, such as experts from related industries and suppliers, have been interviewed to obtain and verify critical information as well as to assess prospects. Key players in the wireless network test equipment market have been identified through secondary research, and their respective market rankings have been determined through primary and secondary research. This research includes the study of annual reports of the top market players and interviews with key opinion leaders, such as CEOs, directors, and marketing personnel. In the complete market engineering process, both top-down and bottom-up approaches have been implemented, along with several data triangulation methods, to estimate and validate the size of the wireless network test equipment market and other dependent submarkets listed in this report. The industry¡¯s supply chain and market size, in terms of value, have been determined through primary and secondary research processes. In this report, the overall wireless network test equipment market has been segmented into equipment type, network technology, end user, and geography. With the given market data, MarketsandMarkets offers customizations according to a company¡¯s specific need. The following customization options are available for the report.